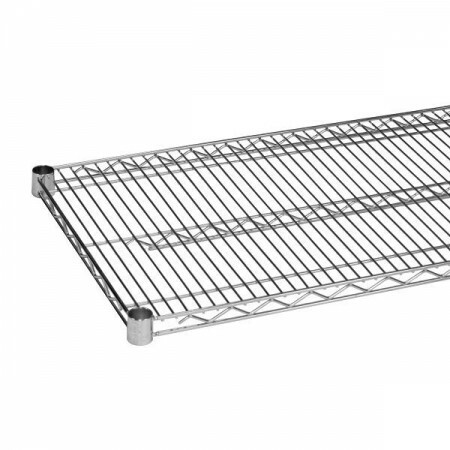 $19.99 Royal ROY S 2424 Z Polycoated Zinc Wire Shelf 24" x 24"
$43.99 Advance Tabco EG-2424 Green Epoxy Coated Wire Shelf 24" x 24"
$17.64 Winco VC-2424 Chrome Plated Wire Shelf 24" x 24"
$18.76 Winco VEX-2424 Epoxy Coated Wire Shelf 24" x 24"
Set up additional storage space in your warehouse, stock room, or foodservice facility using the Thunder Group CMSV2424 Chrome Wire Shelving 24" x 24". Designed with vertical ribs, this shelving piece allows for easy loading and unloading of canned goods and other kitchen supplies. Thanks to its chrome-plated metal construction, this wire shelving provides excellent support for heavy items. For added convenience, this NSF approved wire shelving comes with 4-set plastic clips for easy installation.